The use of silk and other textile materials to weave, knot, capture other components, is an ancient skill. Bracelets that are knotted and woven are softer on the skin, the shape can be firm or loose. The design options are limitless! Wire mesh is colored deep gold, folded over to form a smooth and flexible shape, as well as create "channels" down the center. In the channels are crystals in aqua and peridot green colors, joined by links to stay securely inside. Bracelet is 11/16 inch wide, 7-1/2 inches long, closes with satin brass tongue-in-slot clasp. 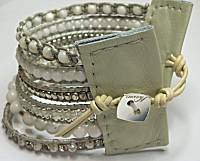 1-3/4 inches wide, blocks of cream color leather hold each end of the 6 beaded strands. The strands have cream color cords with beads sewn into them, in colors of ivory, white and silver. Closes at 7 or 8 inches with button and choice of tied loops. This is ideal to mix with other bracelets for casual style. 7-3/8 inches long, about 1-1/4 inch wide with all the beads jutting forth from the peyote woven seed bead band underneath. Flexible and as comfortable as a ribbon draping around the wrist, the magnetic clasp is completely hidden by beads, easy on and off. Dark and golden browns, topaz gold, tigers-eye. 7-3/8 inches long, about 1-1/4 inch wide with all the beads jutting forth from the peyote woven seed bead band underneath. Flexible and as comfortable as a ribbon draping around the wrist, the magnetic clasp is completely hidden by beads, easy on and off. Bronze and dark browns, seafoam green, chunks of Unakite stone on soft moss and peach colors.